This week, a dead raccoon with a beak (for soul-sucking) or some such thing washed up on the shores of Montauk, Long Island. (Or did it?) Anyway, the horrible and demonic creature must have spoken to the zeitgeist of the blogosphere, as evidenced by Gawker posting "updates" in the form of guesstimates about his species extracted from their own comments every 10 minutes and raking in eleven billion page views in the process. Word of the mysterious photograph spread to the far reaches of the newscycle (see the Montauk Monster here and the Montauk Monster here), and we learned that the entire Internet is necrophilic -- for a time, "monster of montauk" was the #1 Google trend. 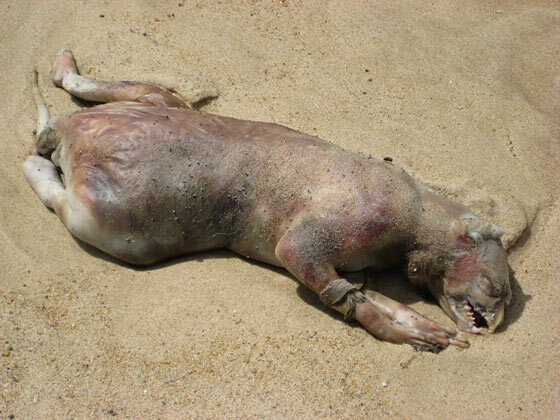 The Montauk Monster quickly became the subject of a biographical blog dedicated to his dark materials, as well as an autobiographic bildungsroman right here on the Huffington Post, in which our hero explained he had just fallen asleep after reading Blink and is not dead, etc. The good people of East Hampton animal control adopted a (justifiably) skeptical eye towards the media's fascination with the beast, passing around Daily Intel's reporters until finally someone three phone calls later said that it was a raccoon, we imagine noncommittally. Still, some denounced the photograph as (quel horreur!) a work of a twisted Photoshopper or worse: viral marketing. Gawker, which has now for whatever reason assumed expertise about the matter, has insisted on the Montauk Monster's legitimacy. It's possible the story will survive past the weekend, but it's looking unlikely, as it seems someone found a 44-pound cat that lost its home due to its owner's subprimesomething. Anyway, wow -- 44 pounds!